Turkish President says US won't be able to secure release of jailed pastor Andrew Brunson by using threats. 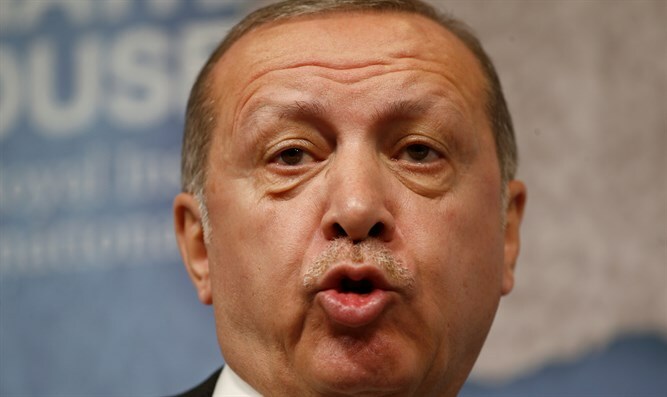 Turkish President Recep Tayyip Erdogan said on Tuesday Turkey cannot fulfill “unlawful requests” regarding US Pastor Andrew Brunson’s ongoing case, Reuters reported. Brunson has been held by Ankara since 2016 and faces 35 years in prison on espionage and terror-related charges. His case lies at the heart of a diplomatic crisis between Ankara and Washington that has prompted a crash of Turkey’s lira currency. Erdogan said Turkey followed the rule of law and the United States would not be able to make progress in the case by using threats. US President Donald Trump recently imposed sanctions on several Turkish officials and a 20 percent duty on aluminum and a 50 percent duty on steel in response to the continued imprisonment of Brunson. Trump recently told Reuters in an interview that he would not make any concessions to Turkey to gain Brunson’s freedom, adding he was not concerned that retaliatory tariffs he imposed will have a ripple effect and hurt the European economy. Erdogan spokesman Ibrahim Kalin recently slammed what he said was the United States' “disregard” for Turkey's legal process. "There is rule of law in Turkey and the Andrew Brunson case is a legal issue. There is an ongoing legal process related to this individual," said Kalin, adding, "It goes without saying that we find unacceptable the disregard of the legal process by the United States, which has been making certain demands."